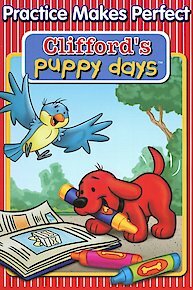 "Clifford's Puppy Days" is a television show featuring Clifford, a large red dog, from the well-known children's books. Clifford is originally an extremely small puppy adopted by a young girl named Emily Elizabeth. Before too long, Clifford quickly begins to grow incredibly large, and he finds trouble throughout the neighborhood. The Big, Big Present The kittens accidentally break the Menorah. Their "sticky" attempts to fix it result in a special, if unusual, Menorah that becomes part of their annual celebration.Credo: Be Responsible/Help OthersHanukah Plunder BlunderZo can't resist sneaking in and opening all eight of his presents on the first night of Hanukah. He soon realizes that he's spoiled his own fun by taking the surprise out of each night. Flo comes to the rescue by allowing him to share in her new gifts. Jorge digs up a shark tooth necklace and doesn't understand why "Finders Keepers, Losers Weepers" apply. Nina and Jorge become instant celebrities when they get their picture in the newspaper. Clifford and Daffodil compete to make Emily the best gift for Valentine's Day. / Emily is uneasy about dancing in front of a crowd. When her stuffed bunny vanishes, Daffodil blames Clifford. / Emily and her friends play against the kids on Mr. Solomon's wheelchair-basketball team. Clifford tries to be a hero to impress Emily. / Things get out of hand when the kids make cookies to thank Mrs. Z for giving them candy canes. The kittens accidentally break a menorah and attempt to fix it. / Zo can't resist opening all of his presents on the first night of Hanukkah. After promising to play with Lewis, Clifford plays ball with his friends instead. / Evan uses his new magic kit and thinks he's made Clifford vanish. Clifford claims he saw a flying dinosaur and a floating teddy bear, but nobody believes him. / Mr. Solomon's potato pancakes don't turn out well. Clifford attempts to throw a surprise birthday party for Daffodil, but his plan falls apart. / When Norville injures his wing, Emily takes him in. Emily Elizabeth, Nina, Jorge and Clifford watch a newsbit on TV about the local City Restoration Project, which inspires them to do something about the empty lot behind the apartment. They enlist the help of Shun, Evan and Vanessa and get to work creating a garden. However, problems soon arise as there seems to be no solid plan. Everyone ends up getting in each other's way and soon things are actually looking worse than they were when they started. Emily Elizabeth, Nina, their families and dogs are taking a day-trip to the beach. Emily Elizabeth and Nina are entering a sand-castle competition and Jorge and Clifford are eager to help out --- it should be a fun time! The stakes are raised, however, when a dog named Jack says that he's sure his owners will win. Pretty soon, Clifford and Jorge are engaging in displays of one-upmanship that leave Nina and Emily Elizabeth quite puzzled. Episode 3 - Puppy Dog Power / Extra! Extra! Episode 2 - Finder's Keepers / You're Famous! Emily Elizabeth, Nina and Shun are out playing kickball, while Jorge is teaching Clifford how to bury a bone. When the three friends lose the kickball, they end up finding a basketball and Nina declares that they can keep it, saying that it's "Finders Keepers." Clifford and Jorge consider this and Jorge especially seems to agree with this logic. When he finds a shark-tooth necklace, he keeps it, even after finding out that it actually belongs to Shun. Clifford feels this isn't right, but wonders how to tell his friend that's he wrong. It's a nice day outside, so Emily Elizabeth decides to take Clifford to the dog park, where there are lots of dogs to play with. It seems like it should be a fun time, but a series of incidents leave Clifford lamenting how small he is. No matter what he does --- from hopping over an obstacle course or trying to get a dog biscuit, it seems like he needs his friends' help because he's too small. His friends help him to see that he isn't the only with such problems --- Jorge's length causes him difficulties, Norville's feathers are maintenance problem and Daffodil's big ears get in her way. Clifford learns that sometimes things that cause problems can also be the same things that make one special. Clifford's Puppy Days is currently available to watch and stream on PBS. You can also buy, rent Clifford's Puppy Days on demand at Amazon Prime, Amazon, Vudu, Google Play, iTunes online.